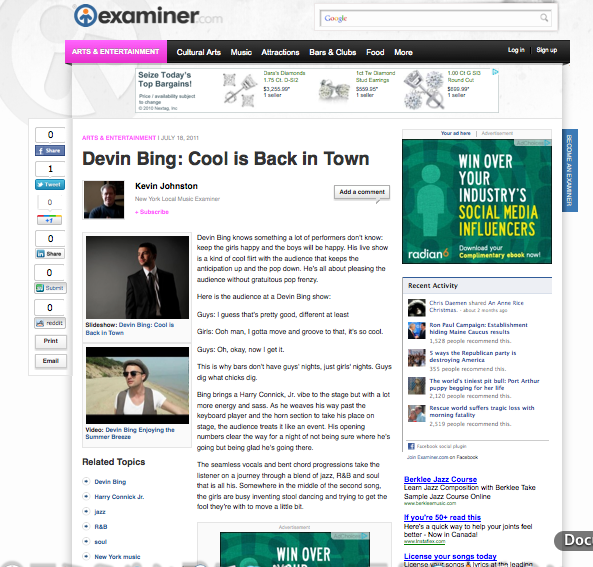 The Examiner.com, a dynamic entertainment, news and lifestyle network that serves more than 20 million monthly readers across the U.S. and around the world, covered Devin Bing's recent show at Sullivan Hall in New York. Kevin Johnston, New York Local Music Examiner sang Bing's praises in his article titled: DEVIN BING : Cool is Back in Town. Image: Courstesy of the Examiner.com.